Robbie likes water. Sometimes. I think he likes the idea of it better than the actual thing. 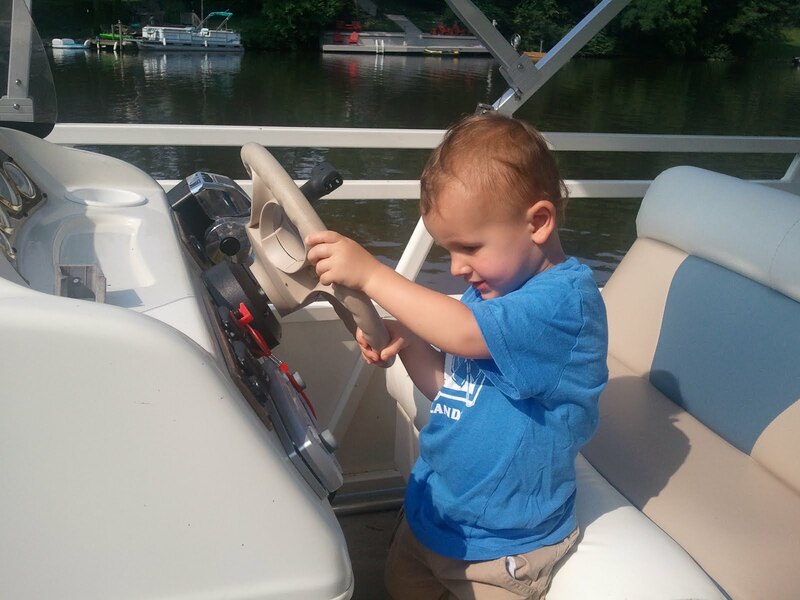 When he got to my aunt’s lake house, he made a beeline for the dock. He wasn’t so sure about swimming at first, but he caught on after my cousin’s son, Will jumped into the water and started splashing around. All of a sudden, he wanted to be just like Will. And they had a blast, splashing around the lake, quacking at the ducks. And then there was the boat ride to fireworks in the middle of the lake. I wasn’t too sure how it would go for several reasons. First, Robbie does not like to wear life jackets. At all. Although, he did much better when he saw all the other big kids were wearing them. Second, his experience on small boats has been minimal and terrifying (remember the airboat ride through the Everglades?). Third, it was nearly 10:00 at night, well past any bed time I would have hoped for him. He fidgeted a little at first, but then the fireworks started. Robbie was enthralled, staring at them with his mouth agape. He turned to look at me, pointed to the fireworks, and, very solemnly, said, “Stars, Mama.” He sat through the entire show that way, sometimes getting a little excited when a really big one was set off, but completely enamored by them. Just like his mama.